Internationally certified guide Evan Stevens, 40, is no stranger to academia. His interest in working in the mountains started with his undergraduate education, where he studied cartography and geographic information systems with a focus on avalanche science. 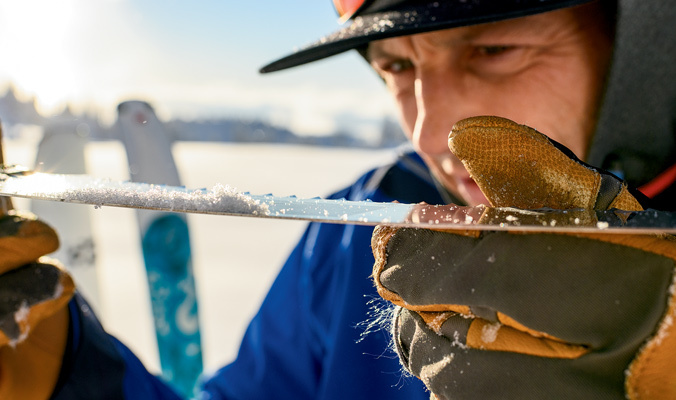 He then applied his degree while working for five years with the Utah Avalanche Center before moving to British Columbia, where he now guides, teaches and oversees ACMG courses and exams. His avalanche and mountain-oriented pedagogy springs from his ethos of paying forward his guiding knowledge and a love for the outdoors. The first thing I tell people when they decide to go into a guide training and certification program is to understand that they’re taking something they do for pure fun and are transforming it into a job and into a career—that’s a big transition. You aren’t skiing for yourself anymore. You can have fun and be in the mountains every day, but it changes the activity. You have to ask yourself if you want to do that. There should be a massive amount of respect for the burden of responsibility of guiding people safely in the mountains. You can be lucky—I was 22 years old working for the Utah Avalanche Center, where I was following around Bruce Tremper, Drew Hardesty, Evelyn Lees, Eric Trenbeath, Tom Kimbrough and Ethan Greene, some of the best avalanche forecasters in the U.S. I got to work five days a week with those people in a professional setting, and it paid off. But there’s no replacement for motivation and hard work, which is how you get yourself into these positions. The more experiences you have with knowledgeable people, the better off you are. It’s a lot of work and time, but it also involves a lot of amazing skiing, so it’s a win-win situation. For the average backcountry skier looking to get out into bigger terrain, I would recommend working on clear communication techniques, finding solid partners and hopefully getting some mentorship. There are a lot of things in the world that you can learn from YouTube, like how to hang your drywall and install a toilet, but snow science has a lot of gray areas for interpretation. It’s not always straightforward. If there were an easy application you could put on your phone that says go or no-go, then it would be a different story. But because that doesn’t exist, you have to put in the time to learn. To get into bigger terrain and bigger objectives, I always come back to the rule of mastery; you need to spend 10,000 hours doing something in order to become an expert. There’s no replacement for experience, and you can’t fast-track that. You log those hours, and you put yourself in a variety of places and situations with different people. You have to know there’s no avoiding that. More people are getting into the backcountry, and as people learn more, they start to expect more. What goes hand in hand with high expectations is a respect for what it means to travel into the backcountry. You definitely see people craving more information because they know the avalanche dragon is lurking, and they respect that—that’s a big part of why people hire me. They want to do cool things that they would not feel comfortable doing on their own, and they understand their limitations because they’re educated users. They want to travel with someone who can make decisions in complex snowpacks and on big terrain. I tell people in the pass-or-fail guide exams that whether you pass or fail does not define who you are and what you have done with your life. The same thing applies to an objective. Being able to ski what you originally planned doesn’t determine whether the day was successful or not. Disassociating yourself from those things is important.